Sort of a blank spot on the map, the Amorgian Forest stirred up our interest when we caught sight of it from the seaside. Our friend Michalis, who also organised the impressive boat trip to the south eastern steep shore, offered his guidance for the overland route to the exposed area close to Amorgos’ easternmost point at Cape Xodoto – a more than amazing trip! Travel literature of the early 19th century refers to several forested areas on Amorgos. Also the construction of ancient buildings, like the monastery of Hozoviotissa, attests large natural wood resources on the island. In folk memory the forest around Mt. Krikelas still exists, though it was burnt to the ground during an enormous forest fire in 1835. But only a few people have visited the existing forest around the slopes of Mt. Papas, due to its taxing attainability. Please Note: the online map, for any reason, does not show the real structure of the landscape (contour lines, summits). Therefore please be sure to use a detailed map for your trip. The first stage of the tour leads from Langada to the chapel of Stavros, passing the monastery of Ioannis Theologos. At the high plateau of Stavros the footpath abruptly ends on the south shoulder of Mt. Pramateftis – 720m. The burgundy red bauxite sand indicates former existing mining activities around Stavros and should be taken as a landmark for the point where rather comfortable hiking changes into serious mountaineering. The terrain of the next leg is characterized by steep rugged rocks and fragile debris. The route circles Mt. Pramateftis alternately uphill and downhill towards the next distinctive point, Mt. Zonaridia – 685m east bound. Mt. Zonaridia is a vegetated high plateau, with a breathtaking view in all directions of the island. From there, the last section demands some climbing skills along a precipitous rugged ridge east bound towards Mt. Papas (keep heading on the right hand side); on which slopes the secret forest expands. On this trip you pass a number of breathtaking viewpoints, it really is worth the effort. As mentioned in Paul Delahunt-Rimmer’s book “this is not a route for the faint hearted”. 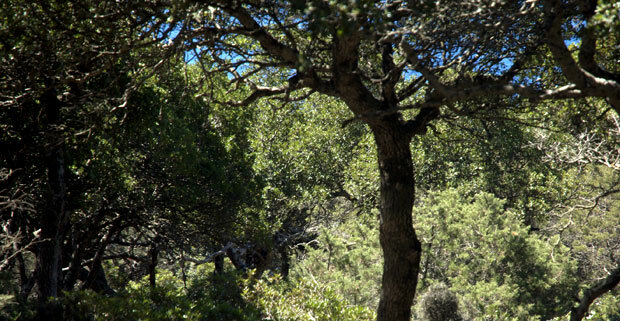 The typical mediterranean forest of sclerophyllous plants, spans about five hectares. 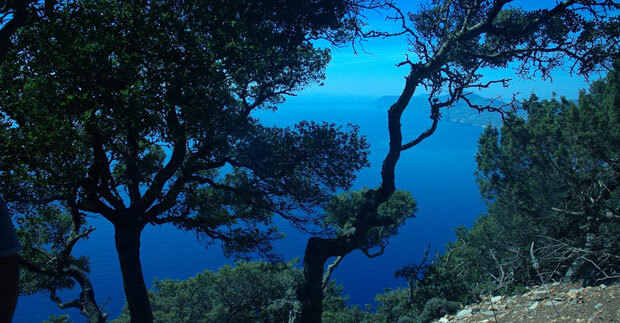 The lush green of up to five meter tall holly oaks and scrubs, blended with the deep ocean blue is a feast for the eyes. See it for yourself, these pictures are worth more than a thousand words … take a look at the Facebook album and see more beautiful pictures! On Amorgos there is no professional mountain rescue organisation like in the Alps. Most of the time, rescue helicopters have to be requested from Athens. Exposed areas are unfrequented for long periods of time. Self-responsibility and a low risk manner is essential! acrophobia. At some parts climbing skills at difficulty level 2 are necessary. Climbing or trekking boots, wind and weather proof jacket, first aid bag with space blanket, sun protection for skin and head – there are no shady resting places for longer distances – are highly recommended. 2 – 3 litres of water is the first priority, a portion for the way back can be deposited at stavros. Snacks rich in carbohydrates to keep the blood sugar on an efficient level. For any further informations contact Amorgos Diving Center in Aegiali. They are also hiking experts and will support you with tips, equipment and guiding activities. erwin October 11, 2010	Log in to reply.